If a single human stride (0.75 meters/.82 yards) is equivalent to 60,000 years, then 6.25 centimeters (2.46 inches) represents the duration of human civilization, which is only 5,000 years old. That means a 12.5-kilometer (7.7-mile) hike would cover approximately one billion years of evolutionary time, back to the beginning of multi-cellular life on Earth. But who would make such a calculation and why? Kevin Saldhana did. 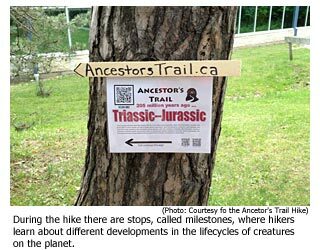 He’s a veterinarian in Ontario, Canada, and the founder of the Ancestor’s Trail Hike in Mississauga, Ontario. 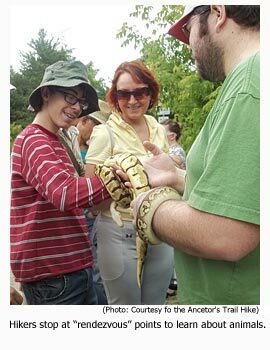 The hike is an opportunity to combine education about the natural world. A pre-set route is mapped against a specific timeline in Earth’s history. During the hike there are stops, called milestones, where hikers learn about different developments in the lifecycles of creatures on the planet. The goal is to go back in time to learn about human ancestors that didn’t look like people but are still part of our biological family. This in turn creates an opportunity for humans to understand the importance of preserving biodiversity. For Saldhana, one of the many volunteers who will participate in the third annual hike June 23, the link between humans and all living beings is essential to reverse the devastation of the natural world by human exploitation. Having studied evolution during his schooling, Saldhana thought he had a good sense of the connection between humans and other living beings. But the notion of a common ancestry, that humans came from other beings and not just apes, isn’t something taught in most schools. The Ancestor's Tale: A Pilgrimage to the Dawn of Evolution by Richard Dawkins takes readers from modern day back through time to identify common ancestors. The book gave Saldhana the idea to recreate that virtual march through time along the Culham Trail, which follows the Credit River in the western portion of Mississauga. The biggest challenge was helping participants comprehend the scale of time. The start of the hike begins in the past. Each step moves people closer to present day. As life begins to appear, the hikers stop at “rendezvous” points to learn about the animals from non-governmental organizations (NGOs), naturalists and other experts. On the 2011 hike, the 6 million year rendezvous focused on the primates of that time. Abner Lico of the Jane Goodall Institute's Roots & Shoots program also talked about the youth leadership program related to environmental issues. Part of the Ancestor’s Trail Hike is a fundraiser for Roots & Shoots. The youth environmental organization connects kids of all ages around the world who “share a desire to create a better world,” by identifying problems in their communities and taking action through service projects and an interactive website. This was added as the result of feedback from hikers who wanted to give something back. Saldhana believes that kind of direct action will come from recognizing that human beings have a responsibility to care for the world from which we come. The science of the past and present creates the understanding of why the fate of other beings should matter to us. Saldhana explains by using the anatomy of modern day humans to draw a connection -- the vertebra in our spinal column formed in the early boney fish. And the gills of a fish evolved over time into a structure used for hearing sound, our ears. Hiker and 2011 trail volunteer Vishal Murthy points out that hikers can get more information on the spot. QR codes on signs at the various stops on the route allow a smartphone to access additional resources about the animals and time period represented. A student of veterinary medicine, Murthy was working with Saldanha when the first hike was organized. “I felt that this walk really drove home the scope and enormity of time and the process of change on our planet,” Murthy says. “Learning about evolution is one thing, but to actually walk the trail as we went from one ancestor to another, it really helped put into perspective how much history we share with animals and how short a time we as humans have truly spent on the Earth." 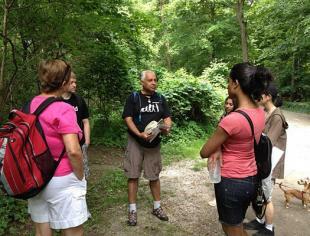 United Conservationists is one of the groups that volunteered to help with the Ancestor’s Trail hike. They included the movie Shark Water by, Toronto filmmaker Rob Stewart, as part of the information they shared. It serves as an illustration of what Saldhana wants people to learn from evolution, geologic time and humanity. The fins are harvest by cutting all of them from the bodies of live sharks. Then the body is thrown back into the ocean. “They can’t swim, so they sink to the bottom of the ocean and die,” Saldhana explains. “There are things that we’re doing that are unsustainable, are really cruel. Saldhana insists science offers the best explanation for the way in which humans fit into the world. “We’re destroying that web of life that we’re intricately connected to. As those connections are breaking down, we’re putting humanity at risk,” he says. Saldhana hopes that by understanding the ancestry we share with a variety of living beings, not just those who seem to look like us, will make it possible to better understand our multifaceted connections with the natural world. If we have a kinship with these creatures, he explains, then there’s an opportunity for a sense of responsibility for the fate of those relations. As the highest form of intelligent life, humans have a unique role and importance in the preservation of life, but that can’t happen as long as people don’t see and feel the need to protect those that can’t protect themselves against us.